The first Street Child Cricket World Cup Tournament, organised by Street Child United, will take place ahead of the 2019 ICC Cricket World Cup in England and Wales. On the account of that, yesterday British Council Bangladesh & Local Education and Economic Development Organization (LEEDO) organised the launch event at British Council Bangladesh head office in Fuller Read. The aim of the Street Child Cricket World Cup is to unite the street children from around the world to play in their own international cricket tournament. This will raise awareness and tackle the widespread stigma and negative treatment these children face in their lives. 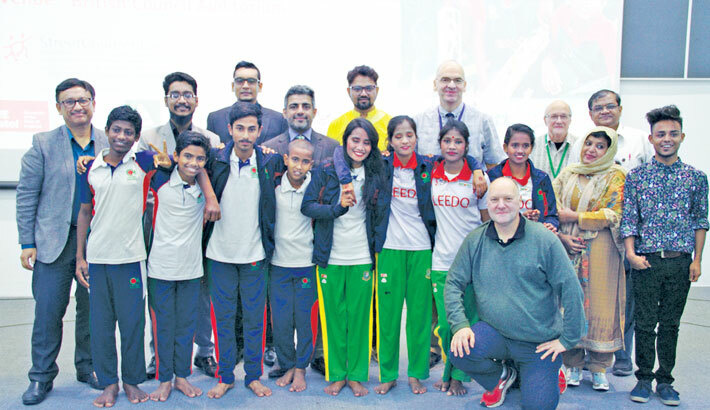 Eight children from Bangladesh were chosen to participate in the Street Child World Cup Tournament which will be held on May 2019 in England. Four girls and four boys between the age of 14 – 17 years old were chosen. The launched event was graced by the presence of Kanbar Hossein-Bor, British Deputy High Commissioner to Bangladesh. Among others, Sebastian Pearce, Director Examinations, British Council Bangladesh; Mike Sheriff, Chair of Friends of Street Children; Forhad Hossain, Executive Director of LEEDO; John Wroe, Chief Executive Street Child United; Auvee Rahman, University of West England; and Khaled Chowdhury, London College of Legal Studies (South) and other officials from British Council were also present. Forhad Hossain and Mike Sherriff believe that this event will able to rise positive awareness among the policy makers and country leaders for taking comprehensive and holistic initiative for the betterment of street connected children of Bangladesh. Children from the Street Children LEEDO Peace Home participated in the launching event of Bangladesh. ‘Friends of Street Children Bangladesh’ is a UK registered charity which aims to improve the situation of children living on the streets of Bangladesh. They support the Street Children LEEDO, a registered NGO in Bangladesh, to provide outreach and education work on the street of Dhaka and a long-term Peace Home for children. These children had been abandoned on the streets and have nowhere else to live. During the event, an exhibition about the position of street children in Dhaka, the work of LEEDO, the support provided by UK Charity Friends of Street Children Bangladesh, and the Street Child Cricket World Cup was launched at the British Council. Additionally, cultural performances by children and Shunno band also took place. The British Council Bangladesh Cultural Centre works to increase cultural bonding in between UK and Bangladesh. The British Council Bangladesh Cultural Centre emphasises on creating equal opportunities and diversities.